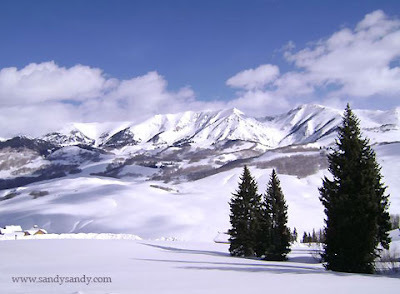 It was a beautiful morning here in Crested Butte Colorado. This picture was taken on a walk up the road from where I am staying. Tonight the winds are really whipping around the Vennel's house, blowing massive amounts of snow about and making the drifts and mountains of shoveled snow even more enormous than they already are. My meeting went very well with the folks at Rijks Family Gallery today. I am really looking forward to working with them. I am meeting with Teresa Rijks again on Thursday to firm up the details of our agreement.